Physical therapists who deal with children (and the MD pediatricians who send them there) believe that tummy time is going to resolve a lop sided head. No it will not. They feel that the infant needs time off of the head so that it can grow and offset the flatness. They are asking the wrong questions. What causes the lopsidedness to begin with? The birthing process and sometimes the last trimester shape and mold the head. The head is a spherical object that is circumferentially compressed. Do not buy into the helmut as an answer. FYI, the helmut was devised/created by what type of professional? …believe it or not…a physical therapist. What do they know about child development? What medical experience with children do they have? Insurance doesn’t pay for it, so it will cost you about $3,000 to harm your child. One brand of helmut is called the “Cranial Band.” How medieval and horrific does that sound? You try and put a rubber band around your head. See how you like it. It is a simple issue in fundamental physics that you do not resolve a compression problem with more compression; the answer is decompression (that’s where osteopaths come in). Things get pretty tight and difficult for pregnant moms in that last month. Mommies, if it was uncomfortable for you, think what the baby is going through. Babies who are breech in that last month tend to be very colicky. Positionally, an otherwise normally free floating and developing head gets trapped underneath momma’s liver and a tight diaphragm; what happens is that the head gets stuck and a downward compression strain hurt these babies terribly. They scream bloody murder because they hurt. Whenever I hear, “Oh she laid in this spot and never moved” my antenna picks up. The next question is why? Most of the time it is because there is no room. There is always compression strain in these cases. If there are multiples, wow, forget it, there is never enough room throughout the pregnancy, never mind the last month. On top of that these babies need to come out early and the effects of gravity on these delicate heads will have long lasting effects, not to mention these heads are softer and are more easily (abnormally) molded. Theses babies manifest their problems with myriad presentations. Right off the bat, some can not latch. Some can not nurse well [the ability to nurse, coordinate suckle and swallow is present by 33-34wks in uterol] but compression at the back of the head kinks the nerve (cranial nerve 9) that controls the muscles of the tongue and back of throat. They tend not to gain weight too well. 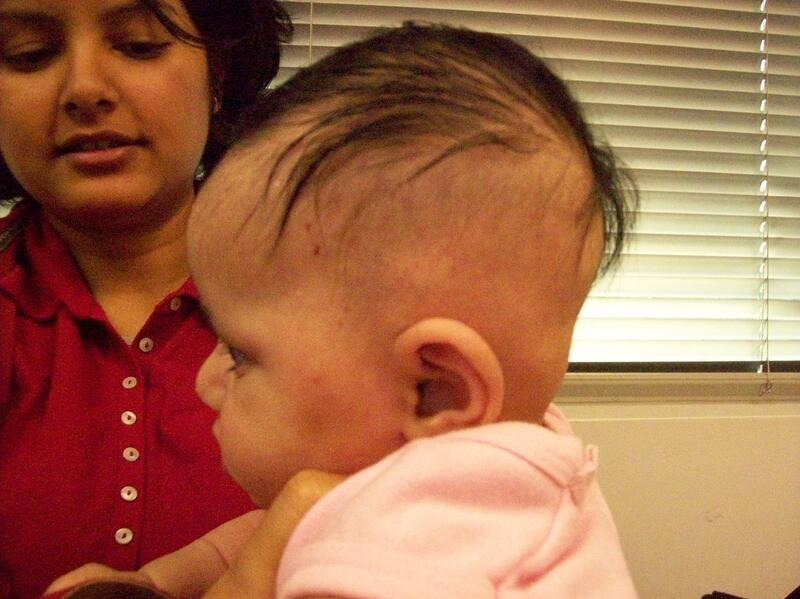 Babies that are compressed may have funny looking heads, but how else can one tell. Intuitive moms will recognize immediately these clues: the soft spot is too small, the soft spot is not soft enough, scalp veins are bulging and blue, usually on one side more than the other, red splotchy face (even when not crying), facial rash. Lets talk about delivery…As labor starts, the infant flexes the head and presents usually the vertex, the top of the head (where the hair whorl starts). As the infant descends, there is circumferential compression of the spherical structure that is our cranium. In order for the infant to pass through the vaginal canal, it has to, get this, spiral the body (this is how and where the plagio starts, and also we believe, the cranial basis of a f uture back scoliosis). Spiralling allows one shoulder to deliver before the other (otherwise, the infant would get stuck if both shoulders tried to deliver at once). When the head crowns, it undergoes head and neck extension. In this whole process, while it is apparently smooth, especially if the amniotic sac is intact, may not be so. There are over 100 bones in the head and face that are being formed in the sleeve of periosteal lining. Anywhere along this pathway, a sleeve can get caught. Have you ever tried to put your hand through a sleeve that is rolled or caught? Near impossible to get it through right? A similar situation is pulling a sweater over a long sleeved shirt when the shirt is bunched up at the shoulder or elbow. You can still go to work, you can still function, but it isn’t comfortable is it? Well, that is how the infant feels. It is not pleasant for them. They just had their brains and skull crushed down about 66% in a ardous process. Some of them do not bounce out of it completely. In our Most Natural State, immediately nursing on the breast helps; screaming from the pain over several months does most of the rest. Cranial osteopathic treatment at any stage will most certainly remedy some or nearly all of this. Here are a couple of my favorite photos. One day I will gather my collection of photos to educate the public. Other interesting adult and children photos can be found on my website: www.doctorhoang.com Oh, sorry. These photos are a couple of my before shots. You can go to the web site to view the great ‘after’ photos.